What Will You Do With Your Tax Refund This Year? Congress passed a law in late 2015 forcing the Internal Revenue Service (IRS) to delay tax refund checks for households claiming the earned-income tax credit and the additional child tax credit until at least mid-February. 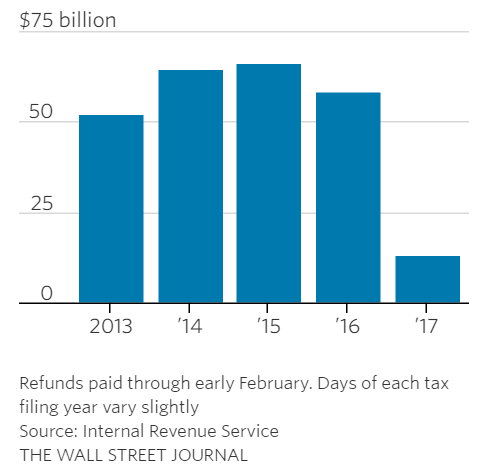 As a result, refunds paid during the early part of 2017 (for the 2016 tax year) were down markedly compared to prior years. Some economists have wondered if this will be reflected in a temporary slowdown of consumer spending. We will know for sure when the retail sales report for February is released next week by the U.S. Census Bureau. Even if the delay did curtail spending last month, it could still be easily offset by a strong rebound in March and April. 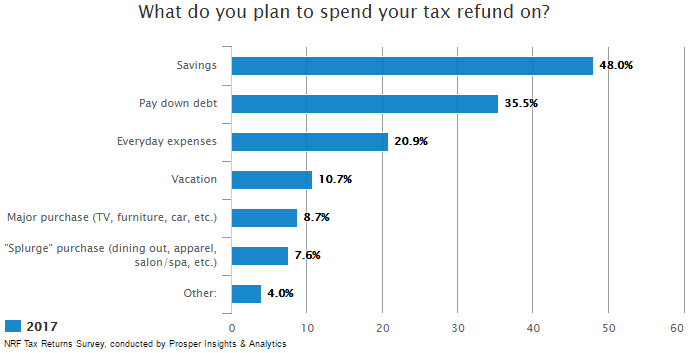 However, recent survey data suggest that many Americans are not in any rush to use their refund for a shopping spree. For example, a new Bankrate poll found that 34 percent of consumers plan to use the money from their refund for “saving or investing,” the highest reading since this survey began. 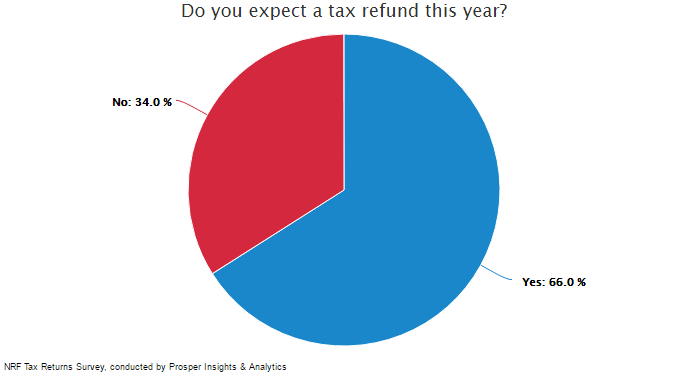 Similarly, the annual tax return survey from the National Retail Federation (NRF) found that 66 percent of consumers expect to receive a tax refund this year but only 20.9 percent plan on spending the funds on everyday expenses. That is a record low for this series, as are the percentages of consumer respondents who said that they expect to use their refund for a major purchase or to splurge on a “special treat.” At the same time, 48 percent of surveyed consumers indicated that they will add the money from their refund to their savings, the second-highest response since this series began. Many Americans enjoy receiving a large refund each year but it is really an inefficient use of one’s cash flow that signals too much income tax is being withheld from each paycheck.